It’s becoming an almost predictable experience, attending an SAP user conference. First comes the spiritual purge of the pre-briefings leading up to the event. Then the unholy pilgrimage to Orlando, then the aesthetic self-flagellation that comes from slogging through a two or three-day schedule of unrelenting meetings, presentations, and deep-fried finger food. Finally, the cathartic release back home to digest the goings-on and bad food and bemoan the next trip to Orlando. Except this year promises to be different. And what is now billed as SAPPHIRE NOW may prove to be one of the more eventful, and memorable, Sapphires in a long tie. The reason is that this is the Sapphire of Second Chances. And no company more richly needs, much less deserves, its share of second chances. SAP has been tottering of late, not rudderless but definitely not on as an even a keel as the competitive and economic environment demands. Its last quarter did look pretty good: there were even some of those near-mythical big price-tag deals that used to characterized SAP’s growth, and the pipeline is looking strong too. But the once unassailable top-dog of the enterprise software kennel has had a rough two years, and its alpha dog status is increasingly in question. And not just by its competitors. There’s a lot of hope that the Sybase acquisition will provide some of the momentum for the Sapphire of Second Chances, and from the buzz I’m hearing that momentum might be well-earned: SAP is getting lots of positive kudos for the boldness of the move, and for the synergies it represents. Of course there is going to be a lot of explaining that needs to be done to customers and partners as to how Sybase fits into their plans. And how well the acquisition ultimately works will only be known over the next 12 months. Regardless, having Sybase now accepted into the SAP fold after having deliberately recused itself from the SAP market is very much in keeping with the second chance theme of Sapphire. So, it’s high time for some second chances, and in a nutshell that’s what SAPPHIRE NOW will represent to me. SAP is teeing up a long list of second chance shots, and taken together they spell a once-in-a-lifetime opportunity for SAP to get its mojo back. My post-hoc analysis of Sapphire will largely center on whether SAP is making good on its second chances, or squandering what may be its last chance at defining a marketing and product arc that will carry it through as the last of the pure-play big enterprise software vendors. I think the potential is there, it’s a matter of messaging and execution. As always. Second Chance # 1 happens to be one I think will work : Business ByDesign. ByD is going to re-launched with a fanfare commensurate with the lost ground SAP had to make up for by being, for once, too early to the market. The main issue will be in the breadth of the sales effort SAP can put forth: there has to be a critical mass of partners and in-house resources to make this product work in the market, and once SAP is done proving that the technology works they’ll have to get busy proving they have the sales structure to make it happen. This Sapphire will also be the second chance for SAP’s vertical industry strategy, once a jewel in its crown, now a briefing point in Oracle’s constant attacks on SAP. That effort will require more than just lip-service to the usual talking points: Oracle has been whittling away at SAP’s position as a vertical leader, and it’s up to SAP to recapture the high ground or lose a major marketing asset. Sybase’s credentials in key verticals like finance and telco will help, but there’s a lot more that needs to be done. The company’s status as an innovator will also be on the line, and if there’s one aspect to SAP that craves a second chance, it’s SAP-as-innovator. SAP gets a lot of undeserved flack for being old and stogy, but the truth is the company has often been its own worse enemy when it comes to showing off the cool stuff it can do (and it doesn’t help that ByD flopped when it first came out: that set back SAP’s appetite for innovation leadership to the stone age or thereabouts). The innovation second chance is embodied in a whole section of the show floor – the Innovation Campus – that is designed to be as hard to miss in Orlando as Mickey Mouse and Diet Coke. This may be one of the hardest second chances for SAP to recapture, but if SAP can turn the corner on old and stodgy it will be a major market coup for a company in need of a major market coup. While it’s not certain at this time, there’s a couple of other pieces of the SAP suite that could use a second chance at Sapphire. I nominate Solution Manager as a key second chance candidate: That all-encompassing and overly-massive, yet completely essential part of SAP’s struggle to lower its customer’s maintenance burden needs to begin the road to redemption soon. SAP’s ability to broaden the market discussion beyond maintenance fees to value and overall TCO is part of a much needed second chance on the cost and complexity issue. NetWeaver is another one: having outlived its usefulness as a Shai Agassi-era disruptive force, the question of its relevance grows unabated. If NetWeaver survives and thrives, it may need more of a second coming than a mere second chance. We shall see. The magnitude of this second chance and its impact is not to be trivialized: SAP now has its fourth and fifth CEO in place since Kagermann began his solo act as CEO in 2003. And that much turnover is, by the nature of CEO turnovers everywhere, rather disruptive to the calm execution of a consistent strategy, to be polite about it. Meanwhile, every time I look at Oracle’s relatively smooth, if at the moment uninspired market position (Hardware??? Sun??? What was Larry thinking? Does he think he’s Tony Stark of Iron Man and Sun is his magic iron suit?) I see the consistent execution that comes from having consistent leadership. That leadership’s message or cool thing du jour may change with the wind (or Sun), but the execution side looks pretty smooth regardless. That leadership consistency is a big part of what makes Oracle the company to beat, and the lack of leadership consistency has been SAP’s Achilles heal for the last two years. It’s not for lack of trying: Léo held back executing his own agenda until he was fully in charge, and then was sacked before he had a chance to make good on the large number of things he did try to change during his short time at the top. Meanwhile, Bill and Jim are working hard to set the stage for a consistent message to the market as well as some big changes in the org chart, but at the moment there’s still a lot of dust in the air and a decent percent of the current reorg still to be fully implemented. And that was before Sybase got added to the mix. Despite the need for second chances, the last few years have not been total chaos by a long shot. The analytics strategy has been thought through and worked through extremely successfully, such that SAP is rightfully claiming a leadership position that is as much about the execution of the overall strategy as it is about the portfolio BOBJ brought to the table. That’s definitely a leadership moment that has survived the management changes and delivered the goods. The company’s Clear positioning is another asset that has survived the turmoil, and Business ByDesign will emerge as an example of consistency and stickwithitness, despite leadership changes on the SME side in recent years. So, for once I’m actually pretty excited about heading to Orlando, despite my trepidations about heading to what must be my 15th Sapphire or so. There’s going to be a lot of interesting reasons to re-evaluate SAP in the Bill and Jim era (and may the Lord preserve me from the temptation to make a Hollywood Brangelina-like name for them.) But, importantly for SAP, these are second chances we’re talking about, not death-bed conversions. 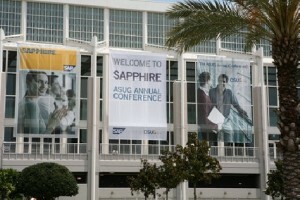 And the fact that there’s plenty of time to make these second chances stick is what should give SAP hope that Sapphire 2011 will be the Sapphire of I Told You So. Or something to that effect.